This striking building sits just inside the inner ring road on the way to Old Catton. Most memorable is the needle-like spire which rises a little incongruously from what is otherwise a typical yellow-brick and slate roof chapel of the 1960s. With three dormer windows and a transept that echoes a semi-detached house of the period, it fits in well with its surroundings - indeed, you might almost call the style neo-domestic. The frontage is bolder, with a large, pleasing vertically-divided window above the entrance, as if this might be a small suburban cinema after all. Oak Grove Chapel is an independent congregational chapel in the Evangelical tradition, and as their interesting website observes it has been a part of the local community here for more than seventy years. 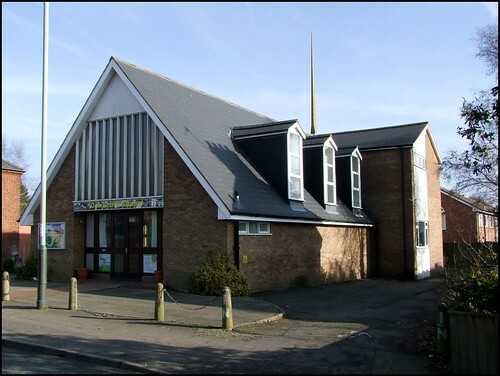 The building itself began life as a Christian Brethren chapel (only in Plymouth and Ipswich have the Brethren been as strong as they were in Norwich), but today the church is just one part of the Oak Grove Trust, a charitable organisation working in Catton Grove and Mile Cross with the local community, particularly children and young people. They also seem to be involved in activities across Norwich as a whole, and unlike some independent churches, which can sometimes be rather inward-looking, there is a great deal of openness and transparency about the work of the Oak Grove Trust, as a Google search will quickly demonstrate.